Here at VerticalResponse HQ, we’re pretty excited about all the insights Advanced Reporting offers users. To showcase the unique edge Advanced Reporting brings to your email marketing, we’re examining each feature individually to highlight its advantages. Today’s feature is Advanced Reporting’s heat mapping. 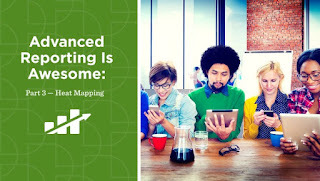 A heat map is a visual representation of where readers are clicking within your email messages. VerticalResponse has always displayed the number of clicks your emails received. Now, with Advanced Reporting, you can see exactly where those clicks are happening. Take a look at our test email below. One person clicked at the uppermost link, but three people clicked the call-to-action button beneath the images. Based on this information, we can tell that our CTA button performed well, just like it was intended to. It garnered the most clicks within the email, which means the majority of our readers took the action we wanted them to. We can also see that at least two of our readers made it all the way to the bottom of our email, which is useful knowledge as well. How does this help you? Advanced Reporting’s heat map feature shows exactly where people are clicking — and where they’re not. If the majority of your clicks are at the top of your emails, you might consider putting the most important information and your CTAs near the top, where the maximum number of people will take advantage of them. Likewise, if the majority of your clicks are midway down or near the bottom, that will help you determine where to position your most important information and links. Finally, if heat mapping shows over the course of several emails that there’s no real pattern to your readers’ clicks, that might mean that you have too many links and buttons competing for readers’ attention, or that they can’t find the information they’re looking for. Knowing this helps you craft emails that perform even better.